XXS: Small puppies – Toy breeds, up to 4lb/2kg, 6-12in/15-30sm. XS: Chihuahuas and Puppies, 4-8lb/2-4kg, 10-13in/25-33sm. S: Pekingese, Shihtzu, Jack Russel Terrier, 8-15lb/4-7kg, 13-19in/33-48sm. M: Mini Poodle, Beagle, Fox Terrier, 15-35lb/7-16kg, 18-25in/45-63sm. L: Bulldog, Bull Terrier, Shar-Pei, 35-55lb/16-25kg, 20-27in/50-68sm. XL: Golden Retriever, German Shepard, 55-90lb/25-40kg, 25-35in/63-76sm. INTERRUPT YOUR PUPPY, when it pees outside its pad. And move it on the pad. DO NOT PUNISH, YELL AT OR HIT your puppy for missing out the pad or going somewhere else! It does not understand why. IF YOUR dog has PEED AT A WRONG SPOT, Clean up well! So that this spot doesn’t remind your dog of peeing back there. IF YOUR PUPPY KEEP THE BAD HABITS, contact a veterinarian or a dog trainer. How to train your puppy indoors? STICK THE PUPPIES TRAINING PAD at one particular spot in your home. WHEN YOU SEE YOUR DOG SNIFFING THE FLOOR and positioning itself to eliminate, move it quickly to the pad. REWARD YOUR DOG for using the pee pad! 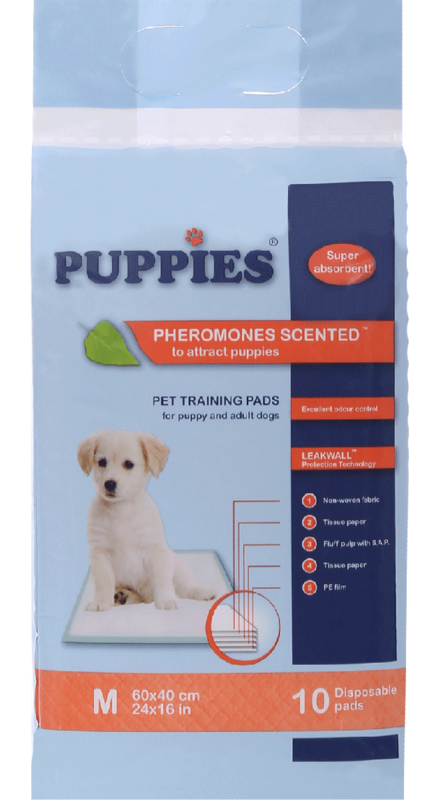 Why pet training pads with pheromones? “Dogs use their noses to locate the place to relieve. Pheromones are organic aromatic molecules secreted by dogs to mark their territory. They trigger responses in other dogs that smell them. 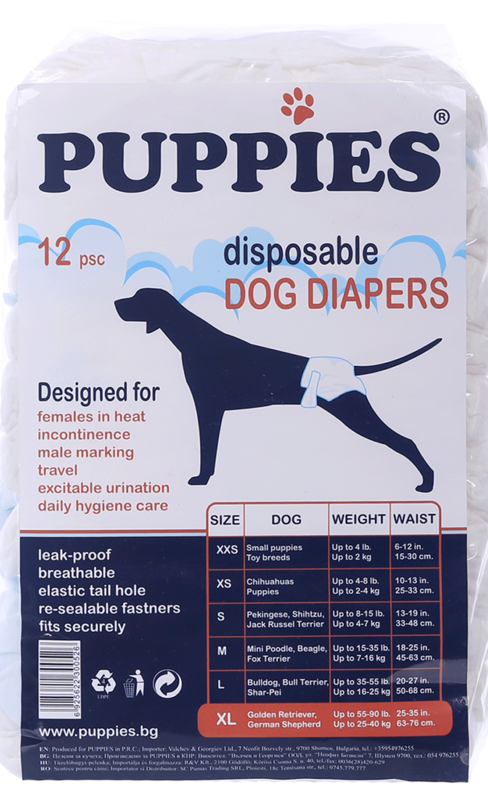 The synthetic pheromones used in dog pee pads are crafted for the purpose of attracting the dog to pee over it in a similar fashion as when they sniff a place that has pheromones left by another dog. This way the dog develops hygiene habits easier and faster, and the use of additional sprays or drops to attract it to the right potty place is unnecessary. 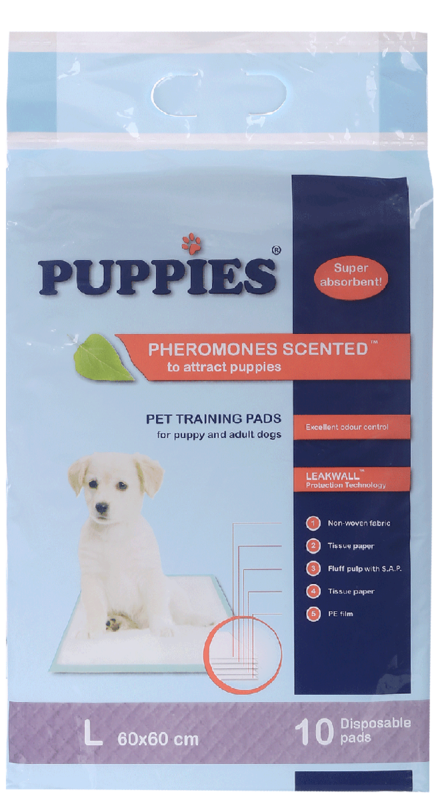 The advantage of pee training pads is their high absorption capacity and the neutralization of unpleasant smell. And fixing them to the floor with patches prevents from folding and moving of the pad, as well as the possibility for the puppy to play with it and tear it. Dogs need training to build habits, and this may require time and patience. 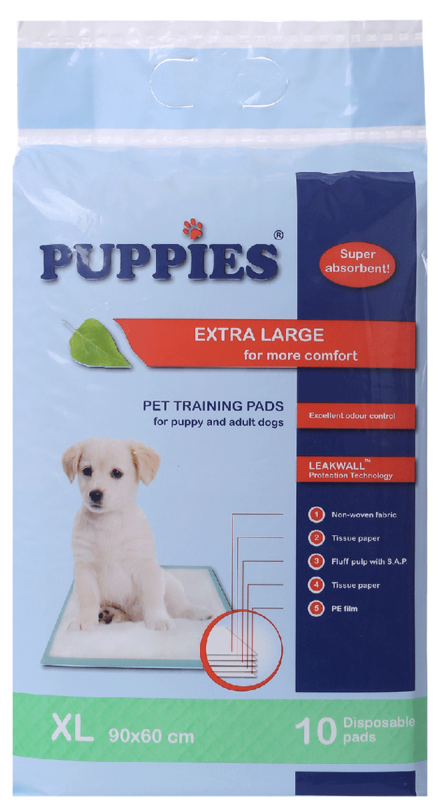 With training pee pads the learning process becomes faster, keeping the home clean and odourless. 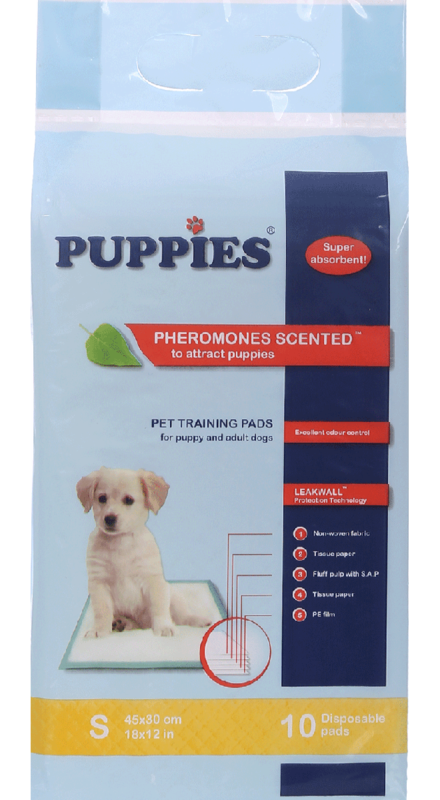 PUPPIES products can be found in pet shops, veterinary clinics and cabinet. or call us at +359 886 739 901.